This white-tailed deer (Odocoileus virginianus) looked over its shoulder at me from the underbrush along King Street today. It's only the second deer I've seen on my walk this year, even though the neighborhood is teeming with them. One evening in 2007, I followed a parade of 14 along Round Hill Drive. There's an easy explanation: during the noon hour, when I walk, deer usually sleep in the woods. (When this one's enormous ears picked up the sound of my camera shutter, it leaped back into the dark space at upper-left.) Their most active hours are dawn and dusk, when they come out onto the lawns and meadows to feed. 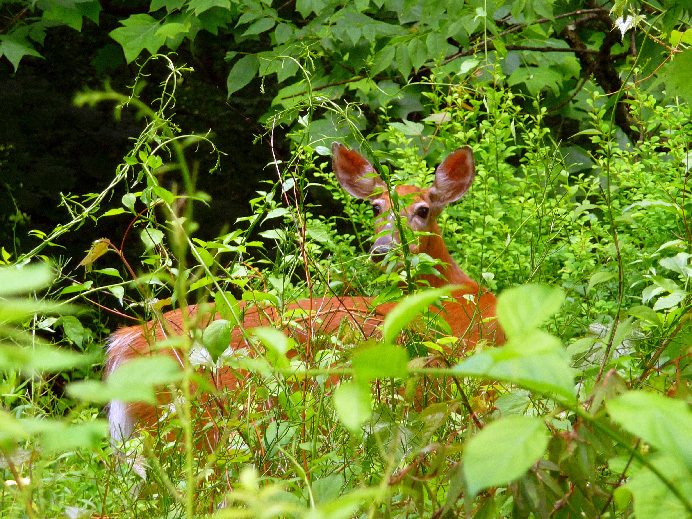 Unfortunately, deer love to eat flowers, vegetables, fruit, shrubs, saplings—almost anything you hope to see flourishing on your estate. Unless you build a 12-foot fence or coat your posies with a foul-smelling repellent, you'll wake up some morning to find your garden clipped as short as a golf green. Meanwhile, deer spread the ticks that infect humans with Lyme disease (first identified in Lyme, Connecticut, just 80 miles east of here), which damages the heart, joints, and nervous system. Arthritis, memory loss, and mood swings ensue. In some cases, the symptoms show up only years after the original infection. The disease is estimated to cost Americans $2 billion a year—of which Connecticut pays a huge share. In my neighborhood, everyone knows at least half a dozen friends and relatives who've had Lyme. When I was growing up in the Endless Mountains of Pennsylvania, we had a perfect solution: hunting. A 15-cent rifle shell could put 100 pounds of venison in the freezer. Hunting was deeply embedded in the culture. On the "first day of buck" each December, factories and offices closed. For two weeks, towns like Horseshoe, Punxsutawney, and Altoona observed Deer Lonely Ladies Sales Days. The universal greeting among men during that fortnight was, "’Juh git yer deer yet?" Back then, I never hunted ("He's kinda strange," I suppose people said), but I certainly wish I could hunt now. Hunting is against the law in these parts. Too many cocktail parties and soccer games for stray bullets to hit. I have a paint gun in my office, a relic of my oldest son's high-school days. I would at least like to send one of these vermin loping about the neighborhood with an embarrassing white bullseye on its flank. But unlike rifle bullets, paintballs fly slower than the speed of sound. Invariably, my quarry hears the fop! of the gun and leaps to safety milliseconds before the ball arrives. But I'm still "learning my lead," as the Pennsylvania folk say. One day, I'll aim just far enough in front of the critter's nose to see him leap straight into my shot. I'll post his humiliating picture here. But first I'll need to talk to my lawyer. Everything is illegal in Connecticut.